Who says you can’t enjoy chicken tenders while adulting? 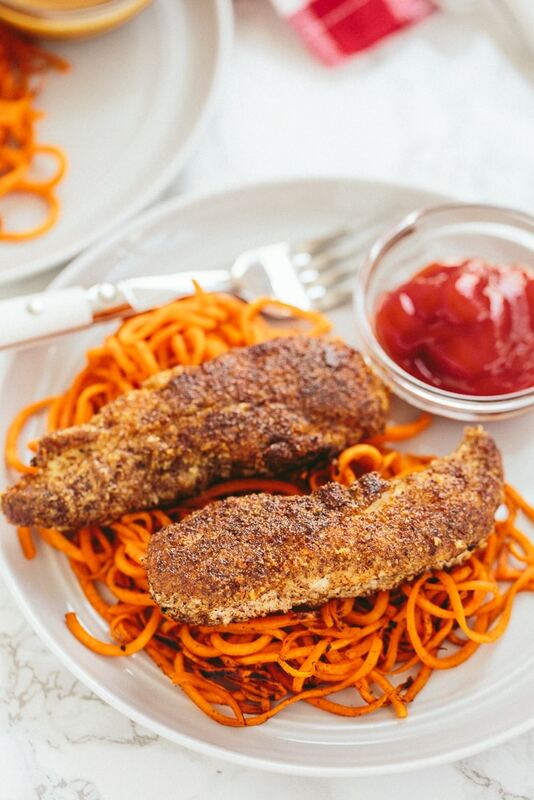 I say you can – and these flaxseed and almond meal crusted chicken tenders will satisfy that childhood craving! 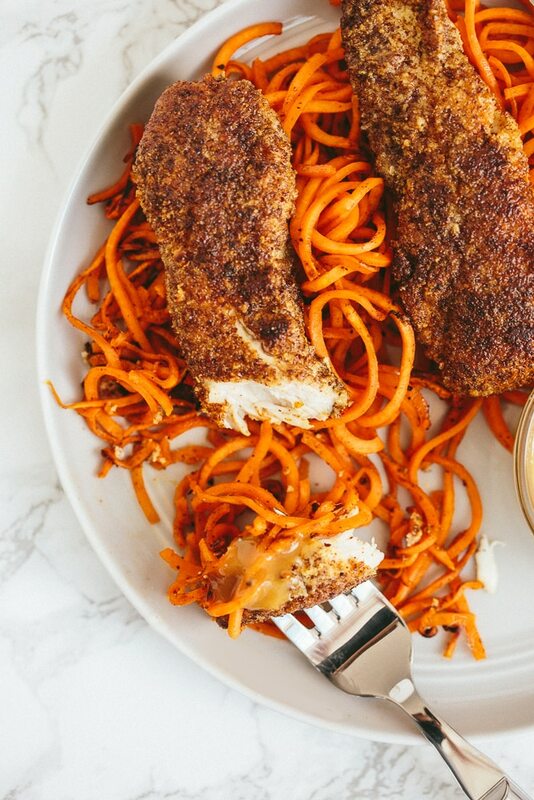 Whether you like your chicken tenders dipped in ketchup, honey mustard, or something else, you’re going to love this healthier, spiralized version. 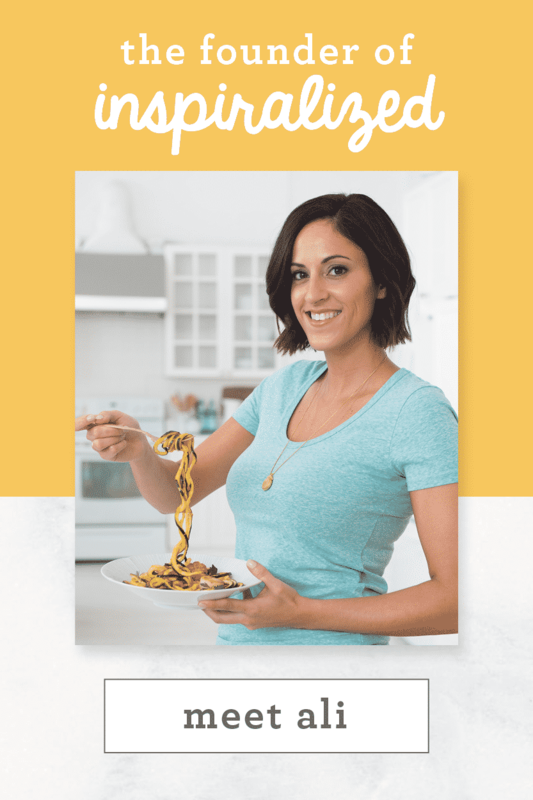 If I’m ever craving something that’s served with fries, I simply swap out the fries with something spiralized. I love my Crispy Baked Spiralized Fries and my Garlic-Asiago Baked Fries, but today, I’m going simple with some sweet potatoes lightly seasoned with chili powder. 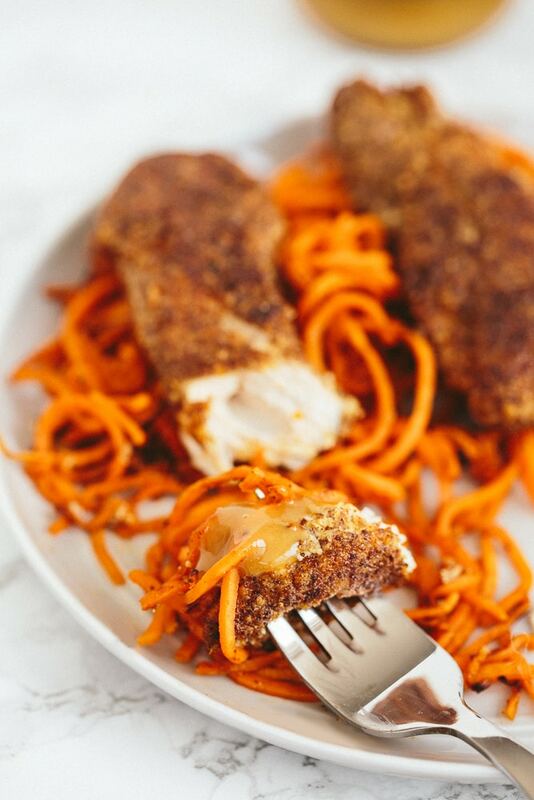 The sweet potatoes satisfy the carb craving, and of course, the true stars of the show are the chicken tenders, crusted in Bob’s Red Mill Flaxseed and Bob’s Red Mill Almond Meal. Their combo together yields the perfect breading that’s not a crunchy tender, but something better: nutty and textured. What I love about Bob’s Red Mill is the quality that’s revealed every time you open one of their bags. 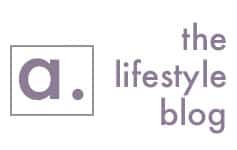 Omega-3s: the biggest benefit of flaxseed is that it contains a high amount of essential omega-3 fatty acids, essential for your body to function properly. Omega-3s even help with things like joint pain and help reduce triglyceride levels, helping fight heart disease. Especially if you’re a vegetarian, flaxseed can be an easy way to get your omega-3s. Fiber: flaxseed is high in fiber, helping with digestion! After reading that, wouldn’t you too want to incorporate flaxseed into your diet as frequently as possible? 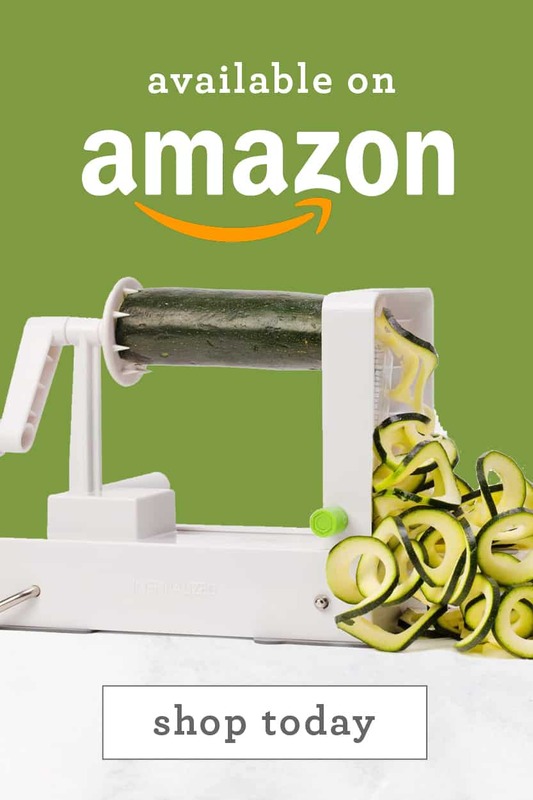 Well, an easy way to use it is to build it into crusting and breading veggies and meats, like with today’s recipe. Now the dippings are totally up to you – I love classic ketchup or honey mustard with my chicken tenders, but use whatever you love! A good tahini sauce could even work here! Note: This post was sponsored by Bob’s Red Mill. However, all opinions are my own, always. Preheat the oven to 400 degrees. Line a baking sheet with parchment paper and set aside. NOTE: If you want to skip the oven, then skip this step. Place all of the ingredients for the flaxseed crust, into a medium mixing bowl and stir to combine. Pour the breadcrumbs into a shallow baking dish and set aside. Beat the egg in a medium mixing bowl and set aside next to the breadcrumbs. 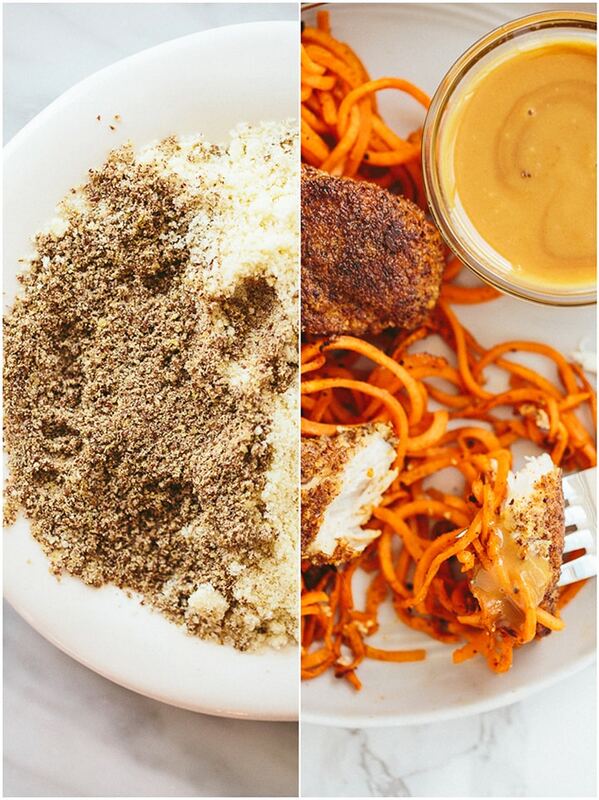 Dredge the chicken in the beaten egg then dip in the flaxseed crust mixture. Dip on both sides and pat the crust mixture into any crevices on the chicken. Place the chicken on the prepared baking sheets and put into the oven for 12-15 minutes or until no longer pink on the inside and juices run clear. If you aren’t oven-baking, cook the crusted tenders in a skillet with olive oil over medium-high heat until no longer pink on the inside. Meanwhile, place a large skillet over medium-high heat and add in the olive oil. Once oil is shimmering, add the sweet potato noodles, season with salt, pepper, chili powder, and cook, tossing, for about 7 minutes or until cooked to your preference. Do you think that this breading would work for other proteins as well? Like white fish for a fish and chips vibe?? Yes, definitely! It would work well on other proteins, for sure. 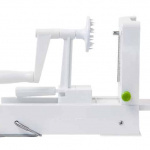 Which blade setting do you spiralize the sweet potatoes on. Mine are usually too thin and burn! Leslie, I indicated in the recipe! Blade D! Ooh, I have all the ingredients, AND I just so happened to thaw chicken tenders for tonight, not knowing what I'd do with them. This is perfection, can't wait to try it tonight! Yay! 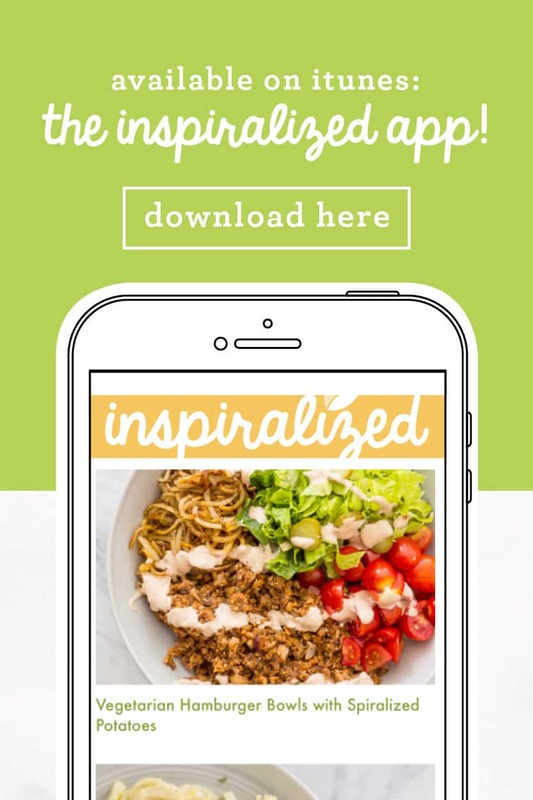 Hope you love it - if you're on Instagram, post a pic and tag #inspiralized so we can see ! Is there a good alternative to Almond meal? My son is allergic to almonds. Would coconut flour work? Also, could a flax egg be used instead of a real egg? I've never had great results with flax eggs, so you could try omitting the eggs entirely! Yes, coconut flour would work - but there would be a slight coconut flavor, of course. Um, YUM! Can't wait to try!! 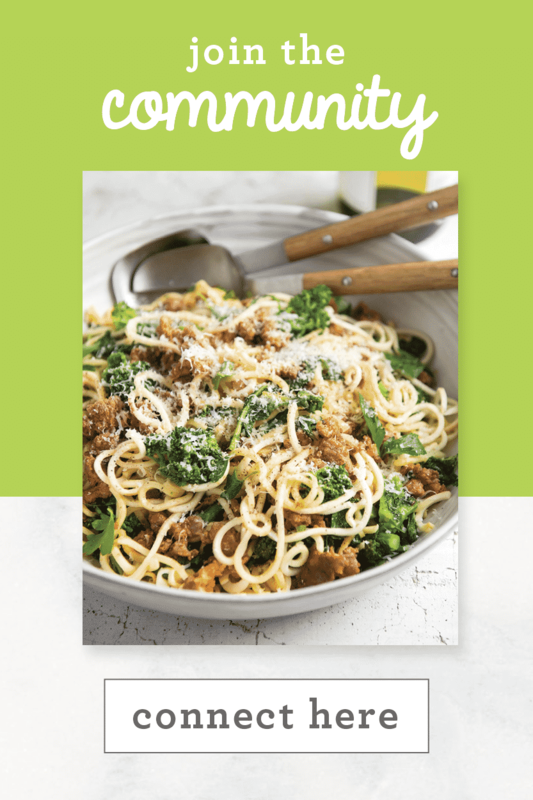 Thx for another delicious looking recipe! Curious, is the flaxseed whole or ground? Cheers from Seattle Heather P.S. 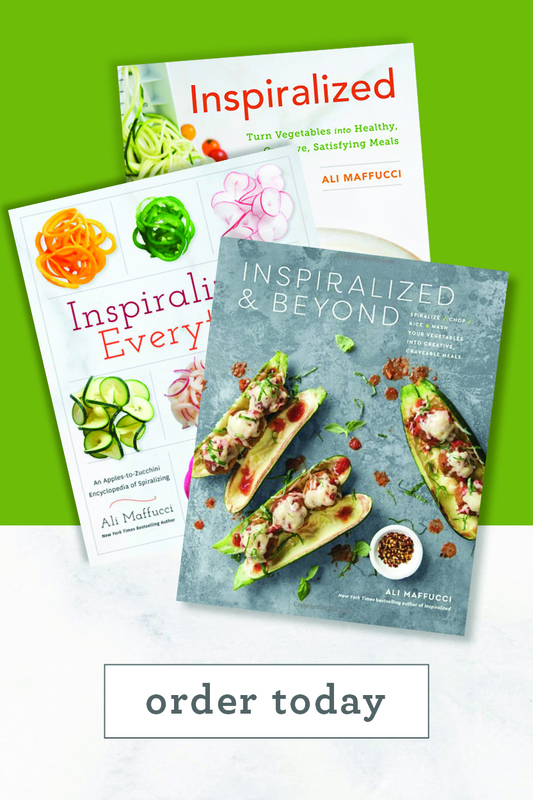 3rd Place Books and Elliot Bay Books would be great options if u did a West Coast book tour! Ali, are the tenders in your pictures baked or fried? They look so good and I want to get the same results. Thanks! Ali, if someone doesn't want the high sugar, high carb count of sweet potatoes, carrots make a great substitute that is also sweet AND carb friendly. That's what I do all the time to any sweet potato, high carb recipe. The carbs are cut in half with a lot more of the carotenoids of the Vitamin A vision correcting and maintaining group. But that's just my take on this great recipe. High fiber ground flax seeds are great for using in place of starchy flour to "fry" a lot of meats. 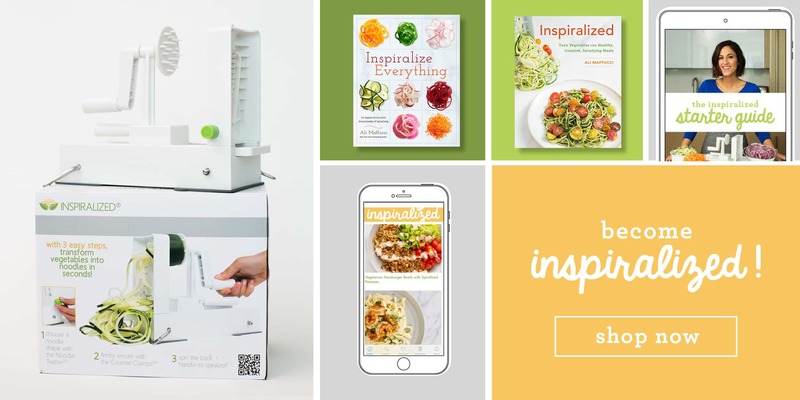 Hi Ali...LOVE the Inspiralizer and your recipes! 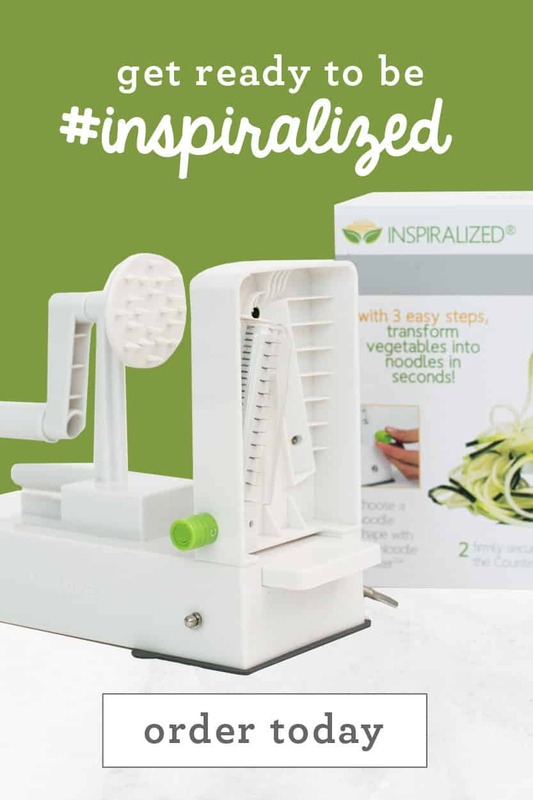 I'm having an issue with my Inspiralizer....the blades will not turn (stuck on 'A'). I've tried running it under hot water, giving it a good scrub down (it's already clean, but I thought I'd give it a try). Anything you can suggest??? Help!!! looks good and I will try as soon as I can get to Trader Joes for the almond meal. In steps 2 and 3 you say "breadcrumbs." Since there are no breadcrumbs in the recipe I assume you mean flaxseed crust mixture as stated in step 4. 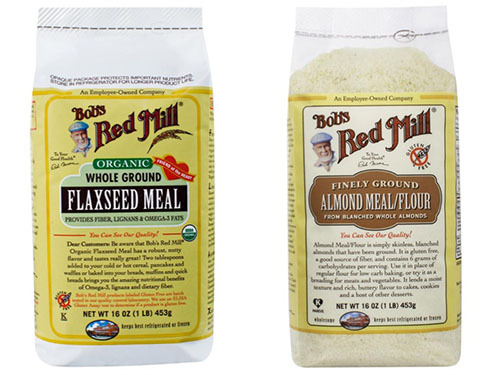 Hi Ali, I'm trying to incorporate flaxseed and more healthy foods for my picky 14 yr old son. His triglycerides are high, so we are starting with his diet. He's allergic to almonds and eggs. Can you suggest something I can replace those with? Thank you! I look forward to trying this out with him. I made these chicken tenders tonight and they were great! I doubled the "breading" recipe and it was just right to bread three large boneless chicken breasts that I had cup up into chicken fingers (25-30 of them). I baked them for 12 minutes at 425. Delish! We love this recipe! We're so glad you enjoyed it.